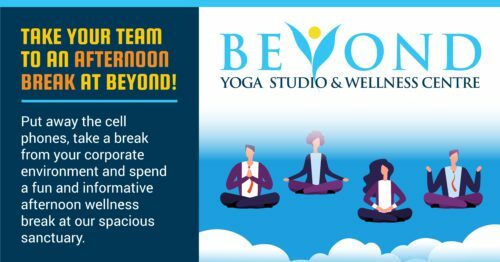 Welcome to Beyond Corporate Wellness! Your employees are your greatest asset. With Canadian workers spending a majority of their waking hours at work, leading edge companies create ideal environments that keep employees motivated, passionate and excited to be working in their organization. Employee Wellness Initiatives are a key component of innovative Strategic Plans. At Beyond Yoga Studio & Wellness Centre, our goal is to assist organizations like yours with wellness services that “Reach Beyond” the basics. Our state of the art facility, dynamic interactive workshops and highly skilled presenters reach employees on a different level with health and wellness programs that they can embrace and use at work every day. We offer innovative programs and services at our state of the art facility, or on-site in the comfort of your facility. Each program and service can be tailored to meet the goals and requirements of your organization. All of our services are performed by highly skilled presenters and teachers in their field. All teachers are certified, insured and have CPR certification. Let Beyond provide an oasis of calm in your workday.